The San Francisco Chronicle has recently reported that a family from Staten Island, New York, was awarded $77,000,000.00 for birth injuries. Specifically, their daughter born 17 years earlier has suffered since birth a severe condition of cerebral palsy. Cerebral palsy is caused by oxygen deprivation to the fetus and results in profound and permanent handicaps to the child. Hospitals and their staff are duty bound to monitor fetal health. When a breach of that duty results in an injury to a child, there is a claim against the staff and physicians and the institution responsible. If you would like more information on medical or other professional negligence please feel free to contact Guy Vining. At the Vining Law Group, injured individuals are always welcomed to reliable and free consultation. These types of cases are normally prosecuted on a contingency fee basis so that you will not pay an attorney fee unless the case is successfully resolved. Guy Vining has been legal counsel in many, many motorcycle, car, and truck crash/accident cases over the years. Elsewhere in the website you can read a lot of material about 1st party and 3rd party cases. Vining Law Group has also represented motorcyclists and drivers in defective road cases. Many single vehicles and multiple vehicle crash/accident cases result from defective highways. Generally speaking, an individual may not sue the government for injuries because of a legal concept entitled “governmental immunity.” However, defective road cases are an exception to governmental immunity. As the infrastructure deteriorates and local roads fall into greater despair and deterioration the hazards for motorists and, particularly, motorcyclists increase. Under MCL 691.1402 governmental units have a duty to maintain and reasonably repair roads so that they are reasonably fit and safe for public travel. This duty includes the responsibility to: inspect for possible damages, deterioration damage, repair, reinforce, correct and generally take reasonable precautions to protect motorcyclists and car drivers from foreseeable dangers. If you or a loved one are injured due to a defective road you must take action quickly. The law requires that you provide a statutory notice within 120 days (about 4 months) from the accident. This notice is required by MCL 691.1404 and if notice is not timely and properly given it will bar your legal actions. You will also need to move quickly to obtain measurements and photographic evidence and an expert witness knowledgeable of road defects such as longitudinal cracking, traverse cracking, alligator cracking, deep and long wheel rutts in black top and other irregularities. These conditions are particularly dangerous to bicyclists and motorcyclists. Please feel free to call for a no cost consultation if you or a loved one were injured on a defective road or highway. You need to speak to a personal injury attorney immediately. At the Vining Law Group all telephone conferences and initial meetings are free. Also, most personal injury representation is on a contingency fee basis so that you do not need to pay out of pocket for legal fees to get the help you need. Guy Vining, an experience personal injury attorney, in metro-Detroit, maintains his office in Taylor, Michigan, where he serves the downriver communities of Monroe, South Rockwood, Gibraltar, Brownstown Township, Grosse Ile, Woodhaven, Trenton, Southgate, Riverview, Allen Park, Lincoln Park, Dearborn, Dearborn Heights, Westland, Wayne, and Ecorse. If you or a family member or friend would like a no-obligation, no cost, consultation/financial analysis, just call or Email Guy Vining of Vining Law Group, P.L.C. to schedule a meeting. The San Jose Mercury News reported the death of a 16 year old girl in Hawaii which prompted a civil suit. The suit charged that a watercraft/jet ski crash was due to the negligence of another watercraft operator. Guy Vining of the Vining Law Group has represented several injured individuals in the past in cases arising out of negligent operation of boats. It’s great to live in the Great Lakes area and enjoy water sport opportunities, however, individuals engaging in recreational activities are still held to a standard of care as to avoid actions which are foreseeably dangerous. In other words, an operator of a watercraft, just as the operator of an automobile, must operate in accordance with a duty to do so in a careful manner. Due to the speeds often involved, as well as, wave and wind action, significant forces are often involved with boat and other watercraft accidents. Couple that with the absence of seat belts and other safety equipment and it is easy to see how negligent operations of boats and other watercraft equals a recipe for disaster. Mix in a bottle of cold beer or another alcoholic drink on a hot day and — a day which started with the broadest of smiles can end with a trip to the Emergency Room or worse. If you or a loved one has been injured in a jet ski, boat, or other watercraft/boating accident and you would like to discuss your rights, call Guy Vining. Telephone conference and initial consultations are always free of charge. Usually, there is never an out-of-pocket attorney fee for personal injury cases as these matters are handled on a contingency fee basis. Marrama v. Citizens Bank of Mass. In a recent blog which discussed that in the Schafer case (6th Cir., 11-1340) that the Michigan bankruptcy statute was approved by the appellate court as passing constitutional muster. Their decision not only is of assistance to Michigan debtors but was a blessing to the local bankruptcy attorneys and judges as it clarifies the law and resolves conflicting opinions. Now bankruptcy attorneys can give their client more definitive advice on exemption planning. It also assists the debtors and bankruptcy attorneys by avoiding litigation within the Bankruptcy Court, in relation to exemptions saving financial and judicial resources. All of this, however, begs the question of what the important distinctions are with respect to exemption planning. This is a deep subject and well beyond the scope of a blog posting. However, there are some immediately apparent benefits for Michigan debtors that they can discuss with their bankruptcy attorney. First, across the board it appears that for unmarried Michigan debtors, who have home equity to be sheltered/exempted, that more can be accomplished under the Michigan Statute. See: MCL 600.5451 and compare to 11 USC § 522(d)(1). In addition, if the Michigan debtor is also a handicapped or elderly individual, the exemptions increase even higher. If you have any questions about exemption planning please feel free to call Guy Vining for a free consultation or another qualified bankruptcy attorney. The 6th Circuit Court of Appeals decided a very interesting and debtor friendly case recently. In re: Steven M. Schafer, Case No. : 11-13401387, the 6th Circuit Court reversed lower court holdings that had determined that Michigan’s so-called “bankruptcy exemptions” were unconstitutional. This is pretty esoteric stuff, but the bottom line is that Michigan has a general exemption statute and the so-called bankruptcy exemptions statute, the latter of which provide more generous exemptions for debtors. In filing a case a debtor in a state like Michigan (which has it’s own statute) must elect to proceed under federal or state exemptions. Earlier rulings struck down the so-called state bankruptcy statute holding in essence that it was an impermissible conflict of state and federal law for Michigan to have “bankruptcy” exemptions because only the U.S. Congress could create these laws as it is to do so under the U.S. Constitution and controls the entire bankruptcy field. One of the main arguments advanced for federal control was to give uniformity and not create conflicts from state to state. Indeed, on an as-applied basis, the Michigan statute actually furthers, rather than frustrates, national bankruptcy policy. As the Supreme Court has repeatedly noted, the goal of the Bankruptcy Code is to provide debtors in bankruptcy with a fresh start. Marrama v. Citizens Bank of Mass., 549 U.S. 365, 367 (2007) (“The principal purpose of the Bankruptcy Code is to grant a fresh start to the honest but unfortunate debtor.”) By permitting debtors in bankruptcy a higher homestead exemption than either the general state exemption statute or the federal exemption statute allow, bankruptcy debtors in Michigan are better able to achieve a fresh start and to obtain “a new opportunity in life with a clear field for future effort, unhampered by the pressure and discouragement of preexisting debt.” Grogan v. Garner, 498 U.S. 279, 286 (1991). Accordingly, Michigan’s bankruptcy-specific exemption statute frustrates the full effectiveness of national bankruptcy policy no more than other statutory frameworks that have survived our scrutiny. As noted in Schafer the so-called bankruptcy exemptions under MCL 600.5451 are substantially more generous to the debtor than it’s federal counterpart in 11 USC 522 (d)(1) or the general exemption statute MCL 600.6023. Indeed, with respect to home equity for an individual debtor (or homestead) it is double the federal statute for a 65 year old debtor or handicapped debtor. This is pretty good news for the debtor but makes things more difficult for the Trustee whose compensation is largely contingent upon the amount of money collected. The bottom line is that elderly and handicapped debtors are really aided by this decision. These honest but unfortunate individuals will get a larger nest egg to embark on their fresh start with. Early in August 2012, local Bankruptcy Court Judge Walter Shapero decided an interesting case that sheds light for lay-persons interested in debt relief and for local practitioners, too. This case is In re Kenneth C. Farkas and may be found at Case No. : 11-59772. “Disposable income” is defined under the Bankruptcy Code as income received by the debtor which is not reasonably necessary for the maintenance or support of the debtor or a dependent of the debtor. 11 U.S.C. §1325(b)(2)(A)(i). This Court has explicitly rejected adopting a per se rule requiring the inclusion of 401(k) contributions in disposable income. In re Beckerman, 381 B.R. 841, 848 (Bankr. E.D. Mich. 2008). Instead, as is required by the plain language of §707 (b)(3) and this Court’s interpretation of the Sixth Circuit precedent, the reasonableness of the debtor’s expenses, including payments made into a 401(k), must be determined on a case-by-case basis looking at the totality of the debtor’s individual circumstances. Id at 848. In this case, the amount of Debtor’s existing retirement savings, as well as his age and time left until retirement, persuades the Court that his 401(k) loan repayments are not reasonably necessary for his maintenance or support, and are therefore includable in his disposable income. Since the debtor had a sizeable retirement account and many years before his retirement the inclusion of the loan as a form of monthly disposable income was determined to be unfair to other creditors. Judge Shapero calculated that in a Chapter 13 plan the creditors would be more fairly treated and would receive about an 18% dividend. He noted that the Sixth Circuit Court of Appeals in re Behlke, 358 F.3d 429, 434 (6th Cir. 2004) had earlier determined that even a 14% dividend was a meaningful dividend. Therefore, it was determined that the case must be dismissed – for ability to pay – or converted to a Chapter 13. It, again, bears nothing that the Bankruptcy Rules are designed to provide equitable treatment to all the actors. Therefore, where disposable income is being spent is fanciful ways or ways which discriminate against other creditors a discharge may be challenged as abusive. In such ceases, the debtor’s fresh start and discharge may be conditioned upon providing some disposable income via a Chapter 13 plan to all unsecured creditors over a period of 60 months. In a case just decided by the 6th Circuit Court of Appeals the conviction of a physician for violation of 18 USC 152 (1) and (2) was upheld. The physician, or debtor, filed a bankruptcy, and failed to schedule as an asset an extensive and valuable collection of collector wines. When the wines were discovered by the trustee a referral was made to the United States Department of Justice for prosecution. Please see USA v. Joseph Carver, Case No. : 12-3026. To be convicted of concealing assets in bankruptcy, in violation of 18 U.S.C. §152(1), the evidence must show that a bankruptcy proceeding existed under the Bankruptcy Code, the defendant concealed interests in property from the bankruptcy trustee or creditors, such interest in property belonged to the bankruptcy estate of the defendant, and the defendant acted knowingly and fraudulently. Wagner, 382 F.3d at 607. A conviction for making a false oath in bankruptcy, in violation of 18 U.S.C. §152(2) requires proof that there was a bankruptcy proceeding, the defendant made or caused to be made a false declaration or statement under penalty of perjury in the proceeding, the declaration related to some material matter, the declaration was false, and the defendant made the declaration knowingly and fraudulently. Sixth Circuit Pattern Criminal Jury Instructions § 10.01 (2011) (mail fraud) (adapted); cf. United States v. Spurlin, 664 F.3d 954, 962 (5th Cir. 2011). Carver’s convictions for these crimes are amply supported by the evidence. Accordingly, Dr. Carver will have to spend the next 24 months or so in a federal prison for making a false oath in his bankruptcy case. As discussed in other blogs, the trade-off for a fresh start is disclosure of all assets and turn over of non-exempt assets for creditors. Failure to do so can lead to the dismissal of your bankruptcy and even time in prison. In a recent case, local Bankruptcy Court Judge Walter Shapero granted the Trustee’s Motion to dismiss a debtors’ case under 11 USC 707 (b)(3). The reason was that the debtors with “some belt tightening” should not have been in a Chapter 7 but had sufficient income to pay a dividend to unsecured creditors and so would have to elect to dismiss or proceed in a Chapter 13. The case is Meletios Golematis, Case No. : 11-52238 out of the U.S. Bankruptcy Court, Eastern District of Michigan. The case turned upon whether the debtors were sufficiently needy – although technically qualified – for Chapter 7 relief. In other words, it was not alleged that the Debtors were dishonest or did anything wrong but argued whether they had an ability to repay some unsecured non-priority creditors going forward. The Court framed the inquiry as follows. Under §707 (b)(3)(B), when bad faith is not a factor, courts examine the totality of the circumstances in determining whether the debtor’s financial situation constitutes abuse warranting dismissal. The UST carries the burden of establishing by a preponderance of the evidence the applicability of this ground for dismissal. In the Sixth Circuit a totality of the circumstances inquiry under §707 (b)(3)(B) involves an analysis of whether the debtor displays a lack of honesty or want of need, either of which alone may provide sufficient justification for dismissal. In re Krohn, 886 F.2d 123, 126 (6th Cir. 1989) In this case, the UST does not allege that Debtors display a lack of honesty. Instead, the UST questions whether Debtors are in need of relief under Chapter 7. In determining whether a debtor is sufficiently needy to justify granting relief under Chapter 7, this Court analyzes whether the debtor has an ability to repay its unsecured non-priority creditors. Krohn, 886 F.2d at 126. The case offers an excellent guide to lawyers and lay-people contemplating bankruptcies as to what are reasonable and necessary expenses for: private school tuition, children’s activities and sports, 401(K) contributions, home maintenance and overall abilities to fund a Chapter 13 plan. If you have these types of expenses you might wish to give this case a read to see how they are viewed locally – a genuine family expense or temporary luxury to be forgone for a while. Again, the goal is equitable treatment to debtors and creditors. This is the way to a debtor’s fresh start and bankruptcy discharge. This case points out that it is not equitable to schedule unreasonably high costs of living to the creditors who would otherwise enjoy a little dividend on the debt owed to them. The San Francisco Chronicle reported recently a large settlement in a case against a “distracted driver.” Specifically, the driver was preoccupied with texting and not paying attention to his duties of safe driving. The defendant- driver’s negligence caused catastrophic injuries including the loss of a leg. 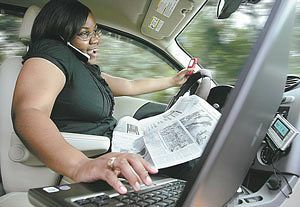 At the Vining Law Group we have represented many, many accident victims of distracted drivers. The causes have ranged from applying make-up, dropping a cigarette, cell phones and the like. In Michigan an inattentive operator who causes personal injury and other damages from a collision is liable to pay for the losses caused. This is both at common law and for statutory violations. For instance, MCL 257.627 makes it unlawful to operate a vehicle in a manner that would not permit it to be stopped in the clear assured distance ahead; and, MCL 257. 626(b) makes it unlawful to operate without due diligence and circumspection so as to be likely to endanger others. If you would like more information concerning your rights in automobile accidents or other personal injury matters, please feel free to contact Guy Vining for a free and confidential conference.